4Eaysoft RM Video Converter is easy-to-use RM to MP3 converter and RM to MPEG video converter which helps you convert RM to MPEG, RM to AVI and RM to MP3, etc. 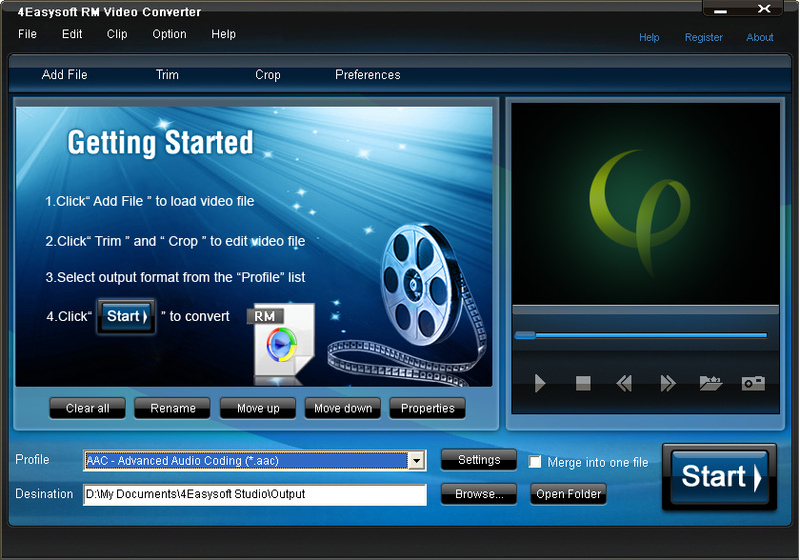 This RM Video Converter supports various output formats including WMV, MP4, 3GP, MOV, VOB, MKV, AAC, WAV, etc. This RM Video Converter makes your conversion colorful with flexible output methods: crop video, trim video and adjust video settings. It provides you excellent image/sound quality with relatively smaller file size just in a few clicks. With features above, 4Easysoft RM Video Converter is the affordable and qualified RM to Video converter! The RM Video Converter can easily convert RM to AVI as RM to AVI converter, with the supporting of converting RM, RMVB to AVI, MPEG, MP4, 3GP, 3G2, MOV, MPG, VOB and WMV. Besides, it’s also a good RM to MP3 converter which enables you to convert RM to MP3, and extract audios including AAC, MP3, WAV, and WMA from Real Media files. 4Easysoft RM Video Converter supports the mobile players such as iPod series, iPhone, Apple TV, PSP, Walkman, Xbox 360, Zune, Archos, iRiver, Creative Zen, BlackBerry, LG, Pocket PC, Smart Phone, etc. 4Easysoft RM Video Converter doubles your enjoyment with joining interesting clips into one. Crop frame size to remove your unwanted area using this RM to Video Converter like smart scissors. Capture images while previewing movies. It can be saved in default folder automatically. Detailed video and audio settings are provided by this RM Video Converter for you to adjust, such as Resolution, Video Bitrate, Frame Rate, Audio Channels, Sample Rate, etc. This RM Video Converter supports batch conversion. You can convert several videos at one time. With the user-friendly interface outside and powerful codec inside, 4Easysoft RM Video Converter brings you the advanced converting process and high sound/image quality. With features above, 4Eaysoft RM Video Converter is an affordable and qualified RM to Video Converter!